Are You Running a Smart Campaign? The savviest campaigns know that it is becoming harder to reach constituents. People are always on the go and many technologies prevent messages from even reaching their intended targets. The most successful campaigns incorporate multiple strategies to ensure success. 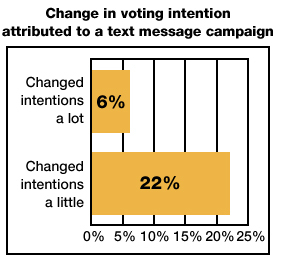 Adding Mobile Can Change Voter Intentions. According to a report by Limbo, mobile marketing can be an effective way to change voter attitudes and behavior. 14% of respondents said that their perceptions of a candidate were more positive after a mobile campaign. In addition, 28% said mobile influenced their voting intentions.